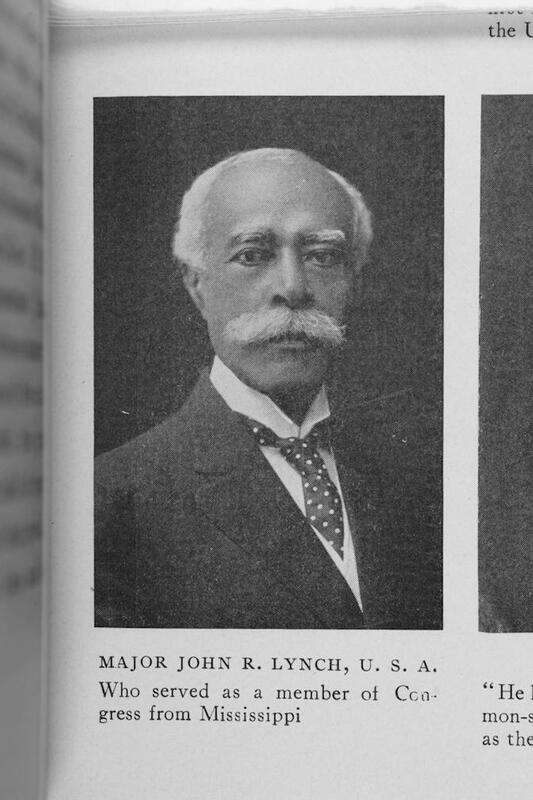 A planter, Reconstruction-era politician, Republican civil servant, and important historian, John Roy Lynch was born on 10 September 1847 on Tacony plantation, near the town of Vidalia, Louisiana, in Concordia Parish. The biracial progeny of plantation manager Patrick Lynch, an Irish immigrant, and slave Catherine White, Lynch followed his mother’s status into slavery. While saving to buy the family, his father died and left them enslaved. Later sold across the Mississippi River to Natchez, Lynch finally gained freedom after Union troops occupied the city in 1863. Lynch remained in Natchez and worked as a photographer during the day and attended school at night. In 1869 Gov. Adelbert Ames appointed Lynch to serve as a justice of the peace. Later that year he was elected to the Mississippi House of Representatives, where his intellect and oratorical skill apparently impressed both black and white colleagues. His legislative record led not only to his reelection but also to his 1872 selection as Speaker of the House. In 1872 Lynch won a seat in the US House of Representatives, and he was reelected two years later. He lost the seat in 1876 but he returned to Congress for almost a year after contesting Gen. James R. Chalmers’s election in 1882. Lynch again failed to win reelection in 1884 and retired to his plantation in Adams County. On 18 December 1884 he married Mobile native Ella Wickham Somerville. Although he considered himself a planter, Lynch continued to study law and engage in politics. From 1883 to 1889 he served the Republicans in several key state and national positions, ultimately receiving a federal appointment from Pres. Benjamin Harrison to serve as an auditor in the Navy Department, a post Lynch held from 1889 to 1893. He briefly returned to Mississippi and gained admittance to the state bar in 1896. He practiced law in Washington, D.C., from 1897 to 1898, when Pres. William McKinley appointed him to serve as a US Army paymaster during the Spanish-American War. Lynch divorced his wife in 1900 and remained in the army, attaining the rank of major and spending three years in Cuba before moving on to postings in San Francisco, Hawaii, and the Philippines. He retired from the army in 1911, married Cora Williamson, and moved to Chicago, where he reestablished his legal practice and launched his writing career. Having experienced Reconstruction firsthand, Lynch was offended by the scholarship written under the direction of William Archibald Dunning, which was sympathetic to white southerners and portrayed Reconstruction as an era of Republican corruption, former slaves’ barbarity, and federal vindictiveness. In 1913 he published Facts of Reconstruction, an alternative to the Dunning School and an inspiration to later revisionist historians. Lynch further challenged scholarly consensus in Reminiscences of an Active Life: The Autobiography of John Roy Lynch and Some Historical Errors of James Ford Rhodes. Lynch died in Chicago on 2 November 1939 and was interred at Arlington National Cemetery.